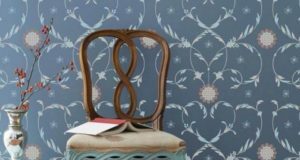 The love of patterns and stencil designs coupled with beautiful decorative paint treatments have led us to discover many creative artists worldwide. 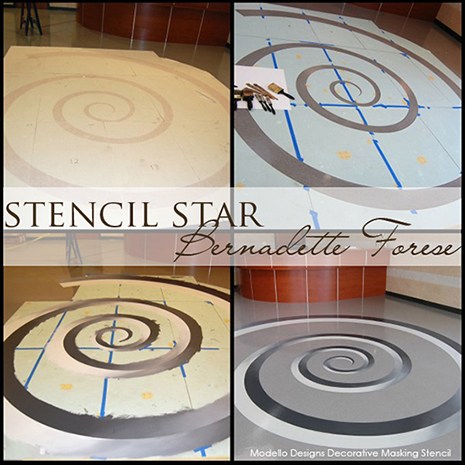 Our Stencil Star™ series seeks to showcase these artists and feature their beautiful work. 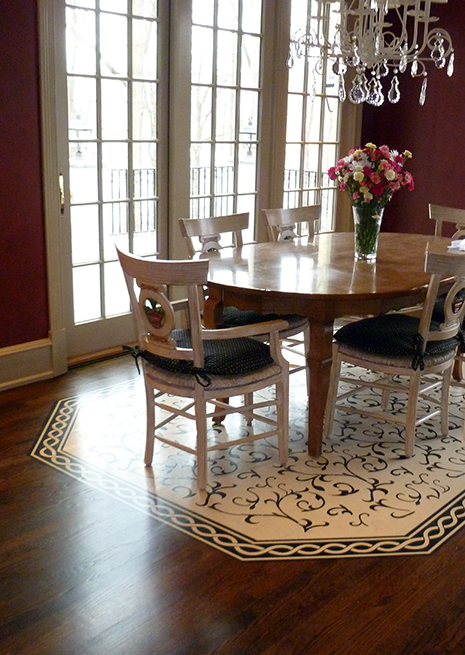 This week we travel to Pennsylvania to see and learn about a few lovely spaces and stenciled floors created by Bernadette Forese of The Faux Pro. 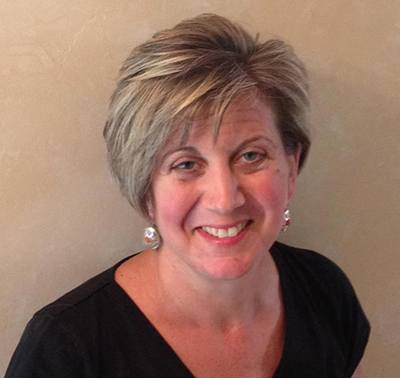 Bernadette Forese is the owner and founder of The Faux Pro, LLC and Philadelphia Gilding, both based in Kennett Square, Pennsylvania. She has a BS degree in Business Management and received professional faux and decorative arts training from international master artists in studios around the world. Her work has been showcased in design homes and in national design magazines. Bernadette opened her business in 2002 and she recognized early on the importance of incorporating pattern and style in to the design. She relies heavily on her ability to understand the spatial relationship between form, function and purpose of each space. Bernadette primarily works on entire homes, large-scale commercial and church projects and brings in her talented crew to assist with them. Although her business is based in Pennsylvania, she travels the country to her client’s homes and businesses. Bernadette was at an Art of Living event where Barb Skivington and I taught a reverse gilded glass finish. Here, she uses the technique on a gorgeous tabletop with a Modello™ Designs Ornamental Border vinyl stencil (OrnBor147). 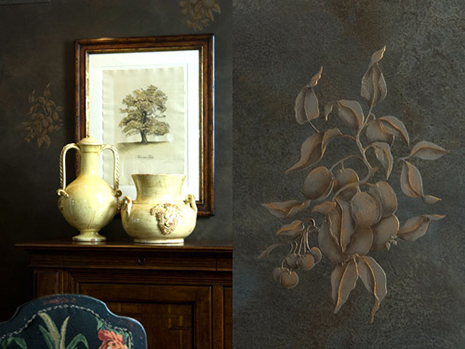 The how-to for this verre eglomise techniqueis available in the Art of Living book. How do you determine what patterns will work for a project? Sometimes there are so many pattern options that the choices can be overwhelming. When determining what pattern will look great in a space, I take many things in to consideration. What is the function of the space? Formal entertainment, casual elegance, etc. What is the natural light in the space and when does it hit? How tall are the ceilings? Is this a commercial space or residential space? And, most importantly, what is the design dilemma that we’re trying to solve? For example, if there are two chandeliers over one large kitchen island, then unifying them with a pattern on the ceiling brings the whole space together. I look through many magazines to get inspiration for pattern but, to be honest, I rely on following Melanie Royals’ blog and her other social media sites for inspiration. I look at the scale of my project and project what different patterns would look like. A spectacular kitchen with the design dilemma of unifying double chandeliers in one space. 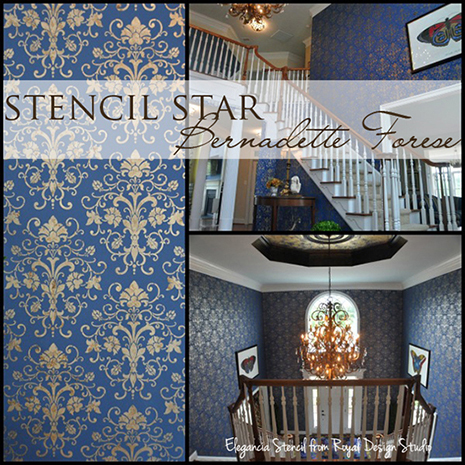 Bernadette used two Modello™ Design Ornamental Center vinyl stencil patterns (OrnCen187) to connect and bring the space together! Composite gold and aluminum leaf were used to stencil in the patterns. 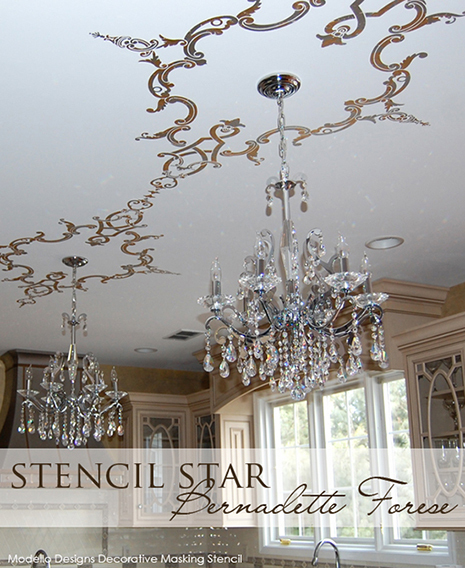 Please share your top Stenciling tip with us. Spray Adhesive or water in a spray bottle! If I’m stenciling with paints, many times I won’t use any spray adhesive; just tape to keep the stencil in place and an off-loaded foam roller. However, sometimes if I’m getting bleed through I’ll grab my water bottle and spray the back of the stencil (just a mist) and the stencil will stay put on the wall! If I’m doing a texture through the stencil, however, I’ll use spray adhesive (3M Super 77) every time. And then Simple Green is one of my best friends; it removes everything that gets stuck to the stencil! (above) The Pear and Plum Botanical Fruit stencil used in elegant, traditional setting. You can see the close-up of the stencil on the right hand side. This was another project that Bernie worked on with us at the Art of Living event. (below) The interior designer on the project, June Shea of Shea Studio Interiors, chose the Elegancia Allover wall stencil in a 2-story residential entryway gracing all the walls perfectly. Composition gold Schabin leaf was used to stencil the design and then waxed to seal it with the blue wall color coming through the broken leaf. What are your favorite surfaces to work on and design for? I actually love working on floors and ceilings. Of course walls are fantastic, too! 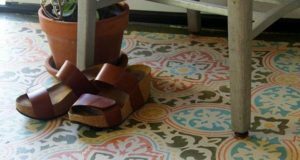 However, applying stenciled floors are creative and fun and, when done properly in conjunction with a flooring company, has the longevity and durability of any hardwood floor because the pattern and paints are nestled under the layers of protective topcoat from the flooring company. Ceilings, too, are great spaces! They’re perfect, in my opinion, because they don’t have the traditional interruptions (door frames, window frames, etc) that normal walls have so the pattern can flow uninterrupted. Custom Modello™ Designs vinyl stencils were used to create the illusion of a rug on the flooring in a residence (above) and incorporate a client’s logo in a commercial lobby (below). 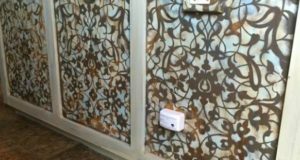 We hope you’ve enjoyed seeing the lovely stencil work of Bernadette Forese and I want to second those tips on using spray adhesive and Simple Green to clean your stencils! 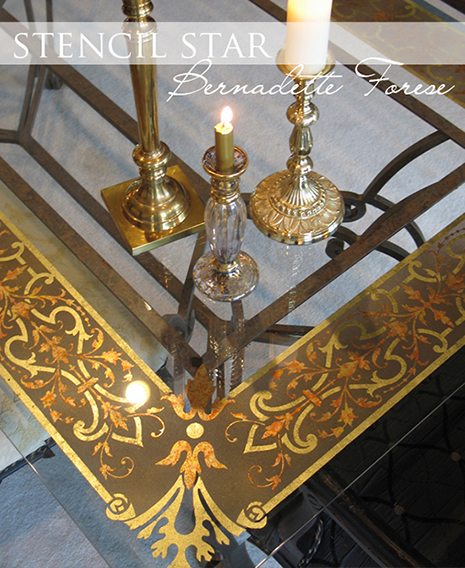 Be sure to visit both her websites, The Faux Pro, LLC and Philadelphia Gilding, to see many more of her projects. She also has a Facebook page where she shares the work of both her studios. 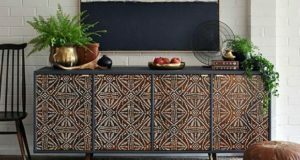 Do be sure to follow us on Facebook to see our fresh and daily stencil and creative inspirations as well as follow us on Pinterest to preview all our fave images incorporating pattern, design and color. We would LOVE for you keep the inspiration flowing and to pin or share these pics with your friends and followers! I loved as much as you’ll receive carried out right here. The sketch is attractive, your authored subject matter stylish.nonetheless, you command get bought an nervousness over that you wish be delivering the following.unwell unquestionably come further formerly again since exactly the same nearly very often inside case you shield this increase. Thanks for sharing your thoughts on losing weight.